I figured since all the students are filtering back over the next few days, that I would do a series of posts in the spirit of Back to School. It'll be a little remedial for those already living in Boston, but hopefully it will help those that are new to the city to get acquainted a little faster. First up, is Back Bay. Back Bay is one of the more expensive neighborhoods in Boston. Read more about it (here) on wikipedia. This area is within walking distance for a lot of students (MIT, BU, Berklee School of Music, amongst others) and is home to some of the best shopping in downtown. 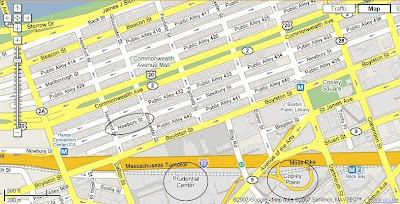 It's a little tough to read, so click on the map to enlarge it, but I've circled 3 of the biggest shopping areas: Newbury Street, The Prudential Center, and Copley Place. In addition, you'll see little blue M's where the T stops are (subway stops). 0 Response to "Back To School - Back Bay"